The Ottawa Race Weekend is one of Canada’s premier race events and takes place every year near the end of May. The above photo shows Norm McEwen with some of the 2012 team members from the Stuttering Treatment Clinic. Standing tall as always among others, Norm was a long time advocate for people who stutter in Ottawa and across Canada. For years he was a Board member of the Canadian Association of People Who Stutter (now known as the Canadian Stuttering Association CSA). 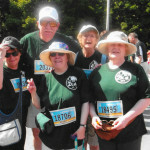 He was also a founding member of the Ottawa Association of People Who Stutter (OAPWS).In addition, as the photo reflects, for many years Norm and other OAPWS members along with the team at the Clinic in Ottawa took part in the Ottawa Race Weekend under the banner of the Ottawa Hospital’s Run For A Reason campaign. Team members raised money for the Marie Poulos Bursary Fund. This fund provides Ontario residents with financial assistance to take intensive and semi-intensive therapy programs at the Clinic. This Clinic is located at the Ottawa Hospital’s Rehab Centre. Once again members of our team will be running and walking in various events. But this year without Norm. Norm died unexpectedly last fall. To say that he was loved by many and that he is greatly missed is an understatement. As many of you know, Norm McEwen died unexpectedly last fall. 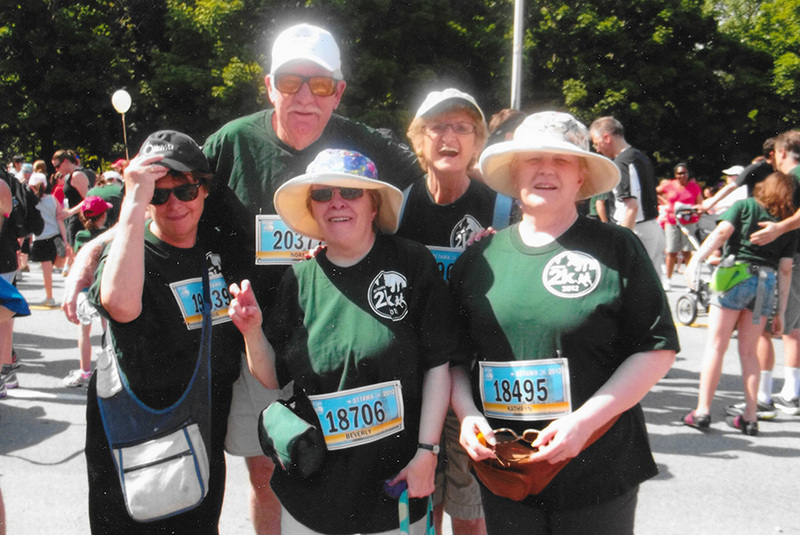 This year the “Talking About Stuttering” team at the Stuttering Treatment Clinic in Ottawa is fundraising in the 2015 Ottawa Race Weekend in memory of Norm. I will always remember the first time I met Norm. Not an auspicious encounter for what later became a very close friendship. In 1997 Norm was attending a Canadian Association of People Who Stutter conference in Vancouver along with several other individuals from Ottawa including my future wife, Tania Kamienski. I was living in West Vancouver at the time, in fact, two blocks from the hotel where the conference was taking place. Tania and I had gotten together the fall before in Ottawa and this was the first time she was visiting me in Vancouver. Being a romantic, I wanted to impress Tania by greeting her at the hotel with a huge bouquet of flowers. I went to the reception desk. There was no Tania Kamienski registered. Tania had assured me she was attending the conference. Had she lied? Was she laying me astray? Fretting around the lobby, I heard a familiar sound. The sound of someone stuttering. I must be in the right place. The person speaking was, as I later learned, Norm McEwen. Being a very perceptive individual, I concluded he must be attending the conference and perhaps knew Tania. OAPWS is participating in the 2013 Ottawa Race Weekend as members of the Stuttering Treatment Clinic Team. This event is one of Canada’s most prestigious race events of the year and takes place on May 25h & 26th. The Team is under the umbrella of the Ottawa Hospital Foundation’s (OHF) “Run For A Reason” campaign. 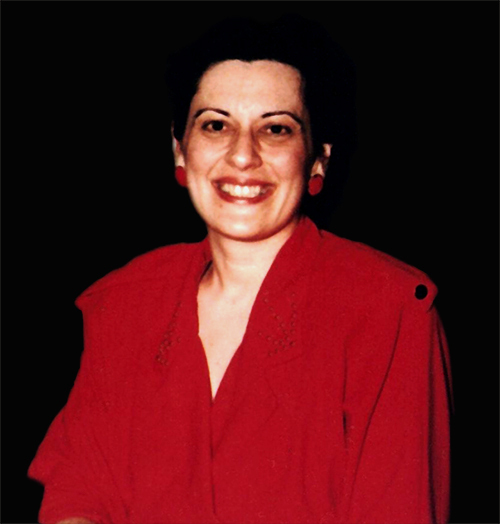 Money we raise will go directly to the Marie Poulos Bursary Fund which enables teens and adults attend speech therapy programs at the Stuttering Treatment Clinic. 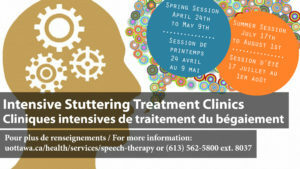 This clinic is located at the Rehab Centre of the Ottawa General Hospital and is only one of three such facilities in Canada to offer semi-intensive and intensive therapy programs for individuals who stutter. The bursary fund is named in honour of Marie Poulos, a speech–language pathologist who worked at the Clinic from 1979 until she was tragically killed in a car accident in 1991. Several members of OAPWS actually knew Marie in the 1990s and can testify first hand what a wonderful speech therapist she was. We are pleased to announce that the Ottawa Family Cinema will have a special screening of the powerful 2012 documentary film, “Bully” on Friday, November 23rd at 7pm. Proceeds from this showing will go to the Marie Poulos Bursary Fund. 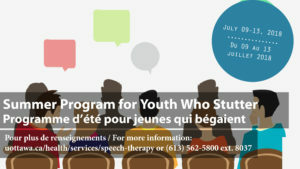 This fund assists individuals who stutter attend intensive and semi-intensive speech therapy programs at The Stuttering Treatment Clinic at Ottawa General Hospital. Tickets are only $6 in advance. The following email was received from Lynn Metthe, Clinical Coordinator, who teaches the first-year speech-language pathology students at the University of Ottawa.